The Left Coaster: Is India at a Political Turning Point? Is India at a Political Turning Point? The recently concluded elections to India's national equivalent of the House of Representatives - i.e., the Lok Sabha ("House of the People") - reflects a potential turning point in India's history as a democracy since it reflects the first sign that a decades-long secular decline in the fortunes of India's largest political party - the Indian National Congress (INC) has finally been reversed. The Indian National Congress (INC), the incumbent ruling party, turned in a strong performance this time despite having severed relationships with some allied parties that helped them form the government in 2004. The INC is now in a much better position to form the new national government with fewer allies, implying that it is likely to be a more sturdy government - which might partly explain the history-making surge of India's stock market in the aftermath of the election results. In my view, this election is significant because this is the first election indicating that the INC has significantly recovered from a historic low in its political fortunes and turned around a long-term secular decline in its performance at the ballot box. Additionally, the evidence suggests that the INC's main rival, the Bharatiya Janata Party (BJP) is facing a bit of a crisis, since it is now on a clear decline from its historic high water mark in the late 1990s. This could have significant implications for both parties and for India. In this post, I will focus primarily on the INC which has ruled India for most of its history, and provide some perspective on the possible implications of this election. The chart* shown below uses historical general election data from the Indian Election Commission, going back to India's first elections since its independence from colonial British rule in 1947. The chart shows two sets of data points - the % of Lok Sabha seats won by the INC and the % of seats won by the BJP, with polynomial fits to the data [NOTE: The party securing the most seats in the Lok Sabha is usually in the best position to form the government]. Before we dig deeper into the chart, a few points of clarification. India's Congress party has evolved over the last several decades and split into other parties at certain times in India's history. The chart only shows the performance of the dominant faction - which is referred to as the Indian National Congress or INC. The chart plots % of seats won rather than the % of popular vote because the latter is less meaningful in India's multi-party democracy with dozens of political parties and numerous independents that typically split the national popular vote significantly. The chart intentionally does not include any seats won by alliance partners of the INC and BJP in order to get a "clean" view of the intrinsic appeal of these two major political parties. The data for the BJP does not start until 1984 because that year marked their first national election as a party (that was founded in 1980 as a successor to the politically weak Bharatiya Jana Sangh). The chart includes the names of the prime ministers of India who hailed from the INC and their approximate durations in power. Finally, it also includes a set of numbers (in pink), the significance of which will be briefly discussed below. 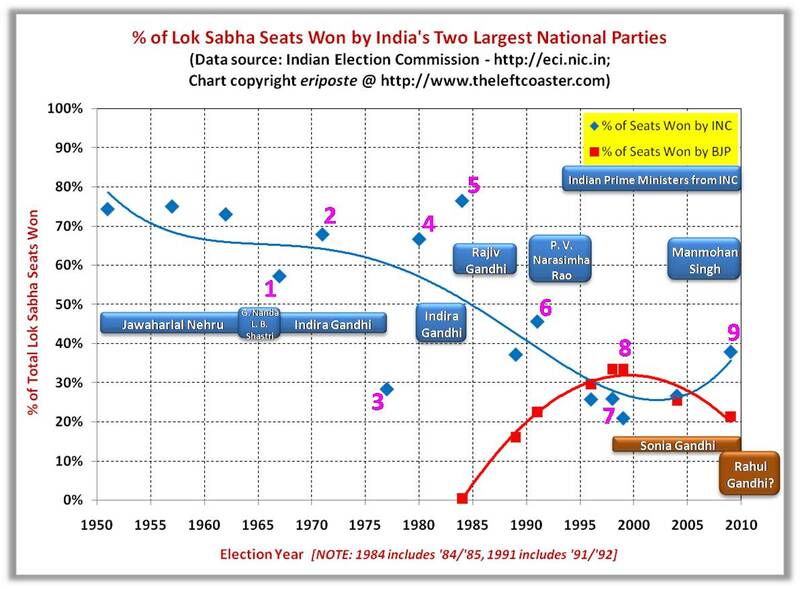 As you can see from the chart, the INC's performance in the Lok Sabha elections had been on a decades-long secular decline - slightly in the 1960s and strongly since the 1980s, hitting an all-time low in the late 1990s. The 2009 election has returned the INC to a position it last had roughly two decades ago, suggesting that the INC is now potentially on an upswing. To understand this better, it is worth briefly reviewing a bit of history. In 1947, India had only one major political party with a truly national reach - the INC. As I explained in my comparative analysis of the post-independence trajectories of India and Pakistan - "Pakistan: The Roots of Failure - Part 1: Authoritarianism & Islamization" - one of the principal reasons for the INC's strength was the fact that is was built over decades as a grassroots-driven party, linguistically organized to attract supporters from India's large number of linguistic regions/provinces at a time when when language mostly trumped religion. The INC's success was also due to India's first Prime Minister, the visionary Jawaharlal Nehru who was key to the INC's emphasis on making India a secular democracy. It is therefore no surprise that the INC largely dominated India's political power structure for almost three decades since its independence in 1947. As India went through numerous linguistic, caste-based, class-based and religious conflicts and challenges since 1947, and as competing political parties rose in strength and reach, the INC's highwater mark in the decade following independence began to gradually erode. The first significant erosion occurred following the death of Jawaharlal Nehru and his successor Lal Bahadur Shastri ("1" in the chart). The INC recovered briefly when Nehru's daughter Indira Gandhi took over the helm and successfully defeated Pakistan in the 1971 war that created Bangladesh. To a significant extent because of her success in executing that military campaign, the INC bounced back in 1971 ("2" in the chart). This was not to last long and India went through a very painful period in its post-independence history as Indira Gandhi declared an emergency and suspended democracy between 1975 and 1977. She was severely punished by the people in the first elections after the emergency in 1977 ("3" in the chart), but partly because of the lack of a strong opposition party and because of the perceived demonization of her in the late 1970s, she and the INC bounced back again in 1980 ("4" in the chart). The assassination of Indira Gandhi and the emergence of her son Rajiv Gandhi in 1984 - initially considered a young, charismatic, "reformer" - produced a wave of support for the INC in 1984 ("5" in the chart), which represented an all-time high. However, 1984 was the start of a free-fall in the INC's fortunes. Rajiv Gandhi's government initially brought some welcome changes but was soon confronted by stories of large scale corruption. Once Gandhi was assassinated in South India by a suicide bomber from the LTTE terrorist group ("6" in the chart), the INC had no strong leader from the Nehru-Gandhi dynasty who could keep the party united. As a result, corruption, factionalism, and splits rocked the INC (even as P. V. Narasimha Rao's government started enacting major economic reforms), thereby leading to the party's political performance declining to the low set in the aftermath of Indira Gandhi's misguided declaration of emergency in the mid-1970s. It was not until the late 1990s, that partly under pressure, Rajiv Gandhi's widow, Sonia Gandhi emerged as a leader of the INC ("7" on the chart) just as the support for the BJP was cresting, especially in the aftermath of their successful execution of the Kargil military conflict against Pakistan ("8" in the chart). At face value, it appears that the emergence of Sonia Gandhi as INC party leader, in combination with the performance (since 2004) of Prime Minister Manmohan Singh - who is generally perceived as a competent and non-corrupt administrator - had the effect of stabilizing the political fortunes of the INC. In 2009 ("9" in the chart), the emergence of the relatively youthful Rahul Gandhi - the son of Rajiv and Sonia Gandhi - as a key leader in the INC added to this mix. Rahul Gandhi has won kudos for his disciplined politics, his extensive campaigning across India (he evidently clocked well over 50,000 miles, especially in rural areas) and his fervent appeals to Indian youth to join the INC and remake the party bottoms-up. As a result, the INC appears to be in the strongest position that it has been in over 2 decades, with new leadership (albeit, in part, of the dynastic kind) providing great potential. Whether or not the INC leadership will capitalize on this and avoid the errors of the past (especially corruption and misrule) is entirely up to them, but if they govern in a manner that increases living standards broadly (and there is no reason to think this is not possible), address terrorism in a meaningful way (thereby reducing some of the impact of the frequent criticism from the BJP), and avoid corruption (the biggest challenge for any political party in India), this could be the start of a sustained recovery in the INC's political fortunes. The recent trend of the BJP's performance in the Lok Sabha clearly suggests that the party's political performance hit a high in the late 1990s and is on a decline since then. There are different reasons for this including the fact that the BJP has generally not been successful in significantly broadening its appeal beyond certain segments in India (mostly in north/central India and partially in the South in the state of Karnataka - whose capital is Bangalore) and its plank of Hindutva has generally not caught on with India's Hindu majority, in contrast with the INC's emphasis on secularism. The BJP party leadership is also older and a bit fragmented. The 2009 election suggests that the BJP's leadership needs to rethink the party's strategy and plank and decide how they want to evolve the BJP in the coming years to once again put the party on an uptrend. This is important not just for the BJP but for India as well since India needs at least two strong, competitive and viable national parties to maintain the strength of its democracy. eriposte :: 9:07 AM :: Comments (5) :: Digg It!